The seized truck. Photo: Gibson Achonu. 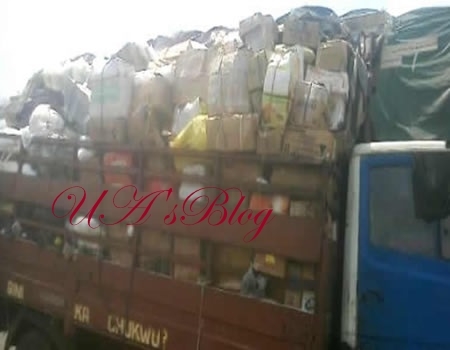 The Nigeria Customs Service, Federal Operations Unit, Zone ‘C’ Owerri, Imo State, says it has intercepted, arrested and seized a registration numberless truck bearing inscription the Gini Ka Chukwu and allegedly carrying illegal and dangerous items worth Duty Paid Value of N9,620,00.